She has all of the advantages of all new Selene models including amazing spacious engine room and the efficient cruisers stern. With a length overall of 44'11", she is the biggest and roomiest "42" in the world. 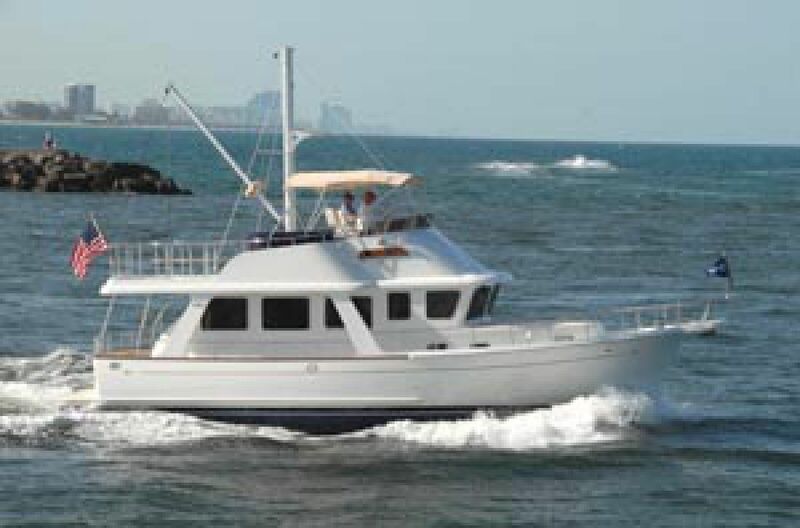 Designed with the cruising family in mind, this offshore cruiser provides all the same quality and safety of her larger siblings, at an affordable price. The Selene 42 comes equipped with a 180 HP John Deere 4045AFM85 diesel, bow and stern thrusters, anchor windlass, full galley, island master berth, oversized head with separate shower and full guest stateroom. She offers the largest upper deck configuration in her class accessed by way of a safe molded stairway. The port side dinette offers comfortable seating/dining for six. Built in to starboard is a sink, bar-b-que grill and abundance of dry storage. 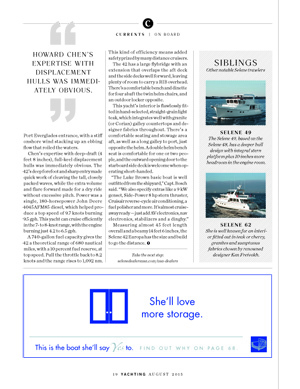 A power assisted mast with crane configuration can easily hoist a tender, scooter, or jet ski from either side. Our stock 42 is available for immediate delivery. We will customize and equip her to your liking. 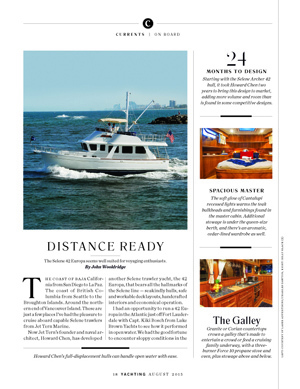 Read the full review of the Selene 42 in the August 2015 issue of Yachting magazine.